Well, reading through every column and article on the election I can find, has its downside. Right about now, there seems to be a surfeit of people claiming one of two extremes. Some, whom I will not honor by naming here, have claimed that John Kerry has locked away the election unless George W. Bush gets a miracle. How a no-bounce, 3-point average lead (remember, the MoE is anywhere between 3.0 and 4.5 points in most polls) becomes a lock, they don’t say, but there are a lot of ‘em saying it. Others insist that because the race is so close now, that there is no possibility it will be anything but a close race all the way. That is a bit more reasonable, but all in all, there' s no reason to believe that's locked in, either. Since Gallup began polling as we know it (with weighting for demographics and regional sampling, etc.) in 1936, there have been 17 Presidential contests available for comparison in poll results. For this article, I decided to see where each was in mid-August of the election year, as well as the final poll before the election, the actual election results, and any unusual movement. I will also use information from this article for another one following it, where I examine the difference between a race between two equal candidates, between a President running for his first election against a challenger, and between a President running for re-election against a challenger. For this article, all poll data is from the Gallup polls at the time, Gallup being the only poll group which has run consistent polls through all of these elections. In 1936, FDR was running for re-election against Alf Landon, and in mid-August he led 49-44, a modest 5-point lead. By the end of the race, polls had FDR up 56-44, and he won with 60.8% (to 36.5%) of the PV. There was no drastic movement in the polls. Gallup was off by an aggregate 12.0 points. In 1940, FDR ran against Wendell Willkie, and led in August, 46-44, a tight race. But FDR opened up a 9-point lead after Labor Day, and although Willkie closed to 52-48, he never caught up. FDR won again with 54.7% (to 44.8%) of the PV. Gallup was off by an aggregate 5.9 points, a distinct improvement. In 1944, FDR ran against Thomas Dewey, and in mid-August led 47-45, once again a close contest. The race was tight all the way, but Dewey never led, and the last poll went to FDR, 52-49. FDR won again with 53.6% (to 46.0%) of the PV. Gallup was off by an aggregate 4.6 points, still improving. In 1948, Harry Truman took on Dewey, and in mid-August Dewey led, 49-36, a pretty big lead. Truman closed on Dewey, though, and in early September had closed to 8 points, and to within 6 by October 1. The last poll, though, still had Dewey ahead, 50-45. Truman won the election, with 49.6% (to 45.1%) of the PV. Gallup was off this time by an aggregate 9.5 points, their worst showing since 1936. In 1952, Dwight Eisenhower ran against Adlai Stevenson, and in mid-August Eisenhower led, 55-41. Stevenson closed to within 14 points by Labor Day, and to within 9 by mid-October, but the last poll had Eisenhowere ahead 51-49, projecting a close finish. Eisenhower won the election with 55.1% (to 44.4%) of the PV. Gallup was off by an aggregate 8.7 points. In 1956, Eisenhower again took on Stevenson, and in mid-August Ike led 52-41. This time, although Stevenson was within 10 points in mid-October, by the end of October Ike was 20 points up, and the final poll was for Eisenhower, 60-40. Eisenhower won with 57.6% (to 42.1%) of the PV. Gallup was off by an aggregate 4.5 points, their best record to this point. In 1960, John Kenendy ran against Richard Nixon, and in mid-August JFK led 48-47, in a race which was tight through Labor Day, when Kennedy pulled a little ahead to a 3-point margin. At the end of October, though, the last poll was very tight again, Kennedy ahead 51-49. Kennedy won with 49.9% (to 49.8%) of the PV. Gallup was off by an aggregate of 1.9 points, an especially good showing in an especially close race. In 1964, Lyndon Johnson ran against Barry Goldwater, and in mid-August LBJ led 65-29. It was never close. Goldwater made a late rush, but only to pull within 28 points. The final poll was 64-36. LBJ won with 61.3% (to 38.6%) of the PV. Gallup was off by an aggregate of 5.3 points. In 1968, Nixon was back, taking on VP Hubert Humphrey, and in mid-August Nixon led 43-31. Nixon was ahead the whole way, but Humphrey made moves in late September, and through October. The last poll was Nixon 43-42. Nixon won with 43.4% (to 42.7%) of the PV. Gallup was off by an aggregate of 1.1 points, their closest match so far. In 1972, Nixon ran for re-election against George McGovern, and in mid-August Nixon was ahead 64-30. McGovern was never in the race, the final poll 62-38. Nixon won with 60.7% (to 37.6%) of the PV. Gallup was off by an aggregate of 1.7 points, again very accurate. In 1976, Jimmy Carter ran against President Gerald Ford, and in mid-August Carter led 51-36. This was an improvement for Ford, who trailed Carter in July 62-29, but Ford wasn’t done. Ford closed again, and the final poll had Carter ahead by only one point, 49-48. Carter won with 50.1% (to 48.0%) of the PV. Gallup was off by an aggregate of 1.1 points, their third straight pick in the X-ring. In 1980, Carter ran for re-election against Ronald Reagan. In mid-August, Reagan led 39-38, a very close race (bet you didn't remember it was still close in August). After the debates, reagan opened a 47-39 lead, but Carter closed fast and in the last Gallup poll, Carter led Reagan 47-44. Reagan won with 50.8% (to 44.0%) of the PV, and Gallup was embarassed for the wrong pick. Gallup also, was off by an aggregate 9.8 points, their worst call since 1936. In 1984, Reagan ran for re-election against Walter Mondale, Carter's VP. In mid-August, Reagan led 52-41. By September 12, Reagan had stretched his lead to 58-37, and basically that was it, with a final end October poll of 59-41. Reagan won with 58.8% (tp 40.6%) of the PV. Gallup was off by an aggregate 0.6 points, their very best showing in the set so far, and a nice rebound from their 1980 goof. In 1988, Reagan's Vice President George HW Bush ran against Governor Michael Dukakis. In mid-August, Bush had just taken the lead, 48-44. The race was very close throughout August and September, but Bush built up a 49-43 lead by the second week of October, 53-39 by the middle of October, and 56-44 at the end of October. Bush won with 53.4% (to 45.7%) of the PV. Gallup was off by an aggregate of 4.3 points. In 1992, President GHW Bush ran for re-election against Governor Bill Clinton (H Ross Perot was also in the race, and actually led in the late spring, but he pulled out of the race in late June, and although he returned in the fall, it was too late to rebuild his campaign). In mid-August, Clinton led 54-39, and appeared to be in control. But Bush closed steadily on Clinton, and by the last week of October, the race was 41-40. But Clinton pulled a bit ahead again, and the end of October was 43-37. Clinton won with 43.0% (to 37.5%) of the PV. Gallup was off by an aggregate 0.5 point, absolutely amazing in its accuracy. In 1996, Clinton ran for re-election against Bob Dole. In mid-August, Clinton led 53-36. In early September, Dole started to close, but the debates were good for Clinton, and although Dole closed again in late September, Clinton rebounded, and the end of October saw the poll at 52-41. Clinton won with 49.2% (to 40.9%) of the PV. Gallup was off by an aggregate 2.9 points. In 2000, Vice President Al Gore took on Governor George W. Bush. In mid-August, Gore was ahead 47-46, a tight race again. Bush retook the lead in late August, only to see Gore take it again in mid-September. The debates worked for Bush and gave him a small lead, which he built into a 52-39 lead by mid-October. But Gore closed fast in late October, and the end October poll was only 48-46 for Bush. Gore took the PV, 48.4% to 47.9%, but Bush took the Electoral Vote and the White House. Gallup was off by an aggregate 2.5 points. For these seventeen elections, Gallup called the Popular Vote Winner correctly 15 times, and the election winner correctly 16 times. They were off by as little as 0.5 points for the two major parties, or as much as 12.0 points, and an average aggregate variance of 4.5 points. Four of the elections were close in mid-August, and two of those finished close, with another three races closing at the end to finish tight. But I took yet another look at the question of bounces, before the GOP Convention takes place at the end of this month. In another post, I looked at the history of party conventions since 1944, but I realize there are some distinctions worth considering. For instance, the party conventions for the Republican and Democrat Conventions in 1944, 1948, 1952, 1956, and 1960 took place too close to each other to measure the effect of each individual convention. I also wanted to consider the difference between the first and second convention to take place, between the Incumbent President and his challenger, and of course take another gander at the difference between the Republican and Democrat party results. As I mentioned in another post (to some dissent), John Kerry improved his internal and base numbers after his party's convention in Boston, but in the big contest, he failed to get a bounce. I speculate that this is primarily due to two factors: Kerry's bounce came early when he named Edwards as his running mate the week before, and also, Kerry's improvement in certain areas was matched by an unanticipated gain by Bush. Both men gained from the Democrat Convention. 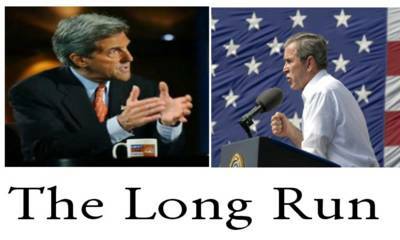 To those who still want to claim Kerry got abounce from the Convention, the numbers are plain: Kerry had a 3-point lead right before the convention, and he held a 3-point lead over President Bush the week after the Convention. Let's agree to that basic point: Kerry definitely leads Bush right now. Yes, it's within the MoE when averaged out, but almost every poll gives Kerry the lead. Consider that point established, and move on. Looking at the conventions from 1964 to 2000, the first convention held averaged 7.4 points for a bounce, ranging anywhere from a -10 bounce to a +28 bounce. The later convention averaged 5.1 points for a bounce, ranging anywhere from a -6 bounce to a +15 bounce. This tells us President Bush will have to buck that trend if he plans to take the lead before Labor Day. Looking at the Challenger vs. Incumbent President, the Challenger (in 1964, 1972, 1976, 1980, 1984, 1992, and 1996) averaged a 7.0 bounce, ranging from a -10 bounce to a +28 bounce. The Incumbent President in those years averaged a 5.7 bounce, ranging from a -6 bounce to a +15 bounce. Again, this suggests President Bush is running uphill. Challengers running against Presidents running for re-election (1972, 1980, 1984, 1996) average a 1.5 point bounce, while the Presidents running for re-election average a 8.8 point bounce. This is the first indicator that Bush may enjoy a nice bounce from his convention. Finally, Democrats in 1964-2000 average a 2.5 point bounce from their conventions, while Republicans since 1964 average a 10 point bounce. Two of the four indicators, then, suggest President Bush will either get no bounce, or may lose ground against Kerry. Another two, however, suggest Bush may not only take the lead with the Republican convention in New York, he may take a large one. The question of which indicator is correct depends on what plan will work. The Republicans, of course, have planned a nice little show in New York. The Democrats have planned protests and will be spending campaign funds on new commercials that week. The specifics have not been discussed by either political party, for obvious reasons: Both parties hope to gain maximum effect from their operations, as time is getting tight. * The Democrats have apparently not realized, the public is increasingly convinced that the protests against the President are being organized by the Democrats, and as such, are negative attacks, all the worse because the Democrats are pretending not to be connected to their operatives. Observe that since "Fahrenheit 911" opened, support for Kerry has not strengthened but President Bush's base has energized. * MoveOn.org is sponsoring another commercial attacking President Bush, and they are letting their visitors choose the ad they will air during the GOP Covention. The absolute last thing the Democrats want, is to let the nastiest and meanest of the Left speak to the nation during the Republican Convention. It will remind everyone about the notorious 'Bush=Hitler' ads, and is essence will reinforce concerns that the Hard Left is an enemy of the average American, and that Senator Kerry is too close to the radicals in his party. The other side, what I expect President Bush to do right, comes down to lessons learned from this campaign. * First off, the cast of speakers for the Republican Convention, frankly, is more interesting than the line-up from the Democrats. Rudy Guliani, John McCain, Arnold Schwarzenegger, and Zell Miller are all prime-time attractions, and have broad appeal to moderates and independants. Also, I have heard rumors about a surprise speaker who may really rock the house. * Next, the Democrats have managed to give President Bush an opportunity they never planned. The Conventional Wisdom is, the Challenger uses the Convention to introduce himself, while the Incumbent is already known. But this year, the image presented to America by the Democrats is so far from the truth, that the real Dubya will be a surprise to many people. Also, President Bush has held back from giving out the details of his second term plans up to now, not only to prevent giving Kerry an early target to aim at, but also for timing. The President will explain his positions to an eager audience, and will open up a package of plans Kerry won't be able to answer effectively, until the debates. Stay tuned, folks, this is going to get fun! On August 1, I published a review of Kerry’s pre-Convention position, so that a more detailed review of the Convention’s effect could be measured. I have not seen all the data I would like, but I have seen enough to present a preliminary view of the results. For the pre-Convention data, I found internals from Marist, Pew, Fox News, the LA Times, the CBS/New York Times, Quinnipiac, CNN/USA Today/Gallup, NPR, and the NBC News/Wall Street Journal polls. For the post-Convention data, I found internals from the Marist, Fox News, CNN/USA Today/Gallup, Democracy Corps, and the American Research Group. I have listed the results for eight key internal factors. If you’re looking for the overall poll numbers, you can find that everywhere else. Before the Convention, 85.4% of Democrats said they planned to vote for Kerry. That dropped to 84.7% after the Convention, which is not at all good for Kerry. Independents voting for Kerry, however, rose from 42.0% to 45.0%, and GOP support for Kerry rose from 5.8% to 7.0%. GOP support for Bush fell from 89.2% to 86.7%. However, Independents’ support for Bush rose from 37.6% to 39.0%, and Democrat support for Bush rose from 8.8% to 9.3%. Certainly not as expected! Men supported Bush over Kerry 47.0% to 43.5% before the Convention. After the Convention, that margin increased to a 51.0% to 40.0% lead. Before the Convention, Women supported Kerry over Bush 47.0% to 40.5%. That lead also increased, now 50.0% to 38.0% Kerry over Bush. More than a few couples may have arguments on this election. Bush’s Job Approval before the Convention was an average of 47.8%, but fell after the Convention to 46.8%. Kerry’s Personal Favorability Average climbed from 40.7% to 53.8% after the Convention, his biggest gain. But Bush also gained, his Personal Favorability rising from 45.3% to 50.5% after the Convention. Finally, when asked who they expect to win the election this November, before the Democratic Convention, 67.3% of Democrats said Kerry would win. That rose to 78.0% after the Convention, a real shot in the arm for confidence. Democrats saying Bush would win fell from 18.7% before the Convention, to 13.0% after the Convention. Republicans saying Kerry would win the election were 10.3% before the Convention, but rose slightly to 11.0% after the Convention. But Republicans saying Bush would win the election were at 77.3% before the Convention, and rose to 80.0% after the Convention. The reason Kerry only enjoyed a small bounce from the Convention is apparent from an interesting effect; Kerry gained, but so did Bush. President Bush will certainly be working on his Job Approval ratings and trying to win over women, but the question I am most curious about now, is what effect the GOP convention will have, on both campaigns. 1: a man distinguished by exceptional courage and nobility and strength. This past weekend, America lost a hero. A real one, the kind that are always hard to find, yet somehow when you most need them, they somehow always show up. That would suggest a benevolent deity to me, but I will leave that for another time. Paul N. “Red” Adair was born June 18, 1915 in Houston, Texas. He died at his Houston home Saturday, August 7, 2004. 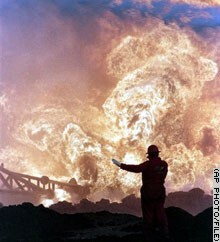 In between, he and his company put out over 2,000 oil well fires, often after other teams had given up hope. After the first Gulf War, Red and his men put out fires in 117 wells in Kuwait. Red’s proudest accomplishment was that he never lost a man to a fire. Not once. These days, anyone involved in oil is presumed to be greedy, self-centered, and reckless. Red was none of these, and frankly, very few men who worked the rigs, who built and maintained refineries, who knew oil from real work in the field, ever fit that description. I know; my father was a Petro-Chemical engineer, and Red Adair was typical of the character of those men, although Red excelled in his accomplishments. The shrill cry against oil men always comes from those who have never worked the stuff close at hand, or who have any idea what it takes to find it, drill it, get it refined and delivered for your use and convenience. At Red Adair’s bio site , you can read about his early life and work, but it’s truly amazing when you discover the scope of his advancement of the science of fighting fires. Red created submersible firefighting vehicles, fireboats, new techniques for automatic shutdown systems in the event of a fire. The key there, is that Red often shared his innovations with the industry, because he knew it would save lives, and he prized that above money every time. Among Red's and Red Adair Company's historic firsts were extinguishing an underwater wild well, a job on a floating vessel and the first U. S. well to be capped while on fire. Some celebrated fires extinguished by Red and his crew were the CATCO offshore fire in 1959, "The Devil's Cigarette Lighter" in 1962 in the Sahara Desert, the massive 1970 offshore blaze at Bay Marchand, Louisiana, the April 1977 Bravo offshore blowout in the North Sea, the IXTOC #1 blowout in the Gulf of Mexico in June 1979 and the Piper Alpha disaster in July 1988. Red had his share of fame. In 1968, legendary actor John Wayne portrayed Adair in the film, “Hellfighters”, which based on Red’s work nickname. It was the only movie in which John Wayne played the part of a real, living person. Adair received congratulatory letters from Presidents Johnson, Carter, and GHW Bush. Red also distinguished himself by his donations of time and money to the Easter Seal Society, the Muscular Dystrophy Association, the Arabian Temple Crippled Children and Burn Institute, the Leukemia Society of America, the Epilepsy Association, and the Cystic Fibrosis Foundation. Earlier this year, Adair gave an interview to NBC. His outlook on his work and priorities can be summed up by three quotes from that interview. Red was the real deal. The next time you tank up, you might think better about the men who work hard to bring you gasoline for your car, your heating fuel, or any number of petroleum by-products. Some just work their butts off to do that, some risk their butts to get the job done. Red would appreciate it. Come to think of it, so would my dad. When I just a child, my father warned me not to lie. "Besides being wrong," he explained, "It's just plain stupid. You'll have to cover it with more lies and always remember your stories to keep them straight." "But sooner or later, you'll still end up getting caught. The truth will get out, it always does." John Kerry should have learned that lesson. But maybe his dad never taught him that one. It began, of course, with Michael Moore, the Democrats' pit bull of the year. The malicious film maker loudly claims he is not a Democrat, not is he working for Kerry, and Kerry's team officially, and loudly, declares that there is no connection between Kerry and Moore. Of course, Moore's ability to keep his stories straight is self-defeating: Moore said flatly that he is "on a singular mission - and that is to remove George W. Bush." In his money-rich but fact-poor movie, Fahrenheit 9/11, Moore taunted President Bush for waiting seven minutes after learning that a second plane had struck the WTC, before leaving the school. It has been a popular talking point for Democrats, ignoring the fact that FDR took no action, did not even make any statements on the day of December 7, 1941, when the enemy was clearly known and the danger clear. It ignores that President Kennedy took no action for almost two days after learning the Soviets were building a Cuban missile complex in 1962. And a Pittsburgh columnist observed that not reacting in panic to a threat, was once the hallmark of courage and cool resolve. But of course, neither Moore nor Kerry has any intention of admitting President Bush might have acted with resolve and steady nerves. On August 6, Senator Kerry gave in to temptation and played the Moore card in a conference with minority journalists. Perhaps a good example of Kerry's true response may be taken from his own words about 9/11, what he actually did that day. "Well, I haven't been briefed yet, Larry. They have offered to brief me; I just haven't had time. But all Americans are united in our efforts to defeat terrorism." "I was in the Capitol. We'd just had a meeting -- we'd just come into a leadership meeting in Tom Daschle's office, looking out at the Capitol. And as I came in, Barbara Boxer and Harry Reid were standing there, and we watched the second plane come in to the building. And we shortly thereafter sat down at the table and then we just realized nobody could think, and then boom, right behind us, we saw the cloud of explosion at the Pentagon. And then word came from the White House, they were evacuating, and we were to evacuate, and so we immediately began the evacuation." OK, got that? Kerry is watching TV at Daschle's office, and they see the second plane hit. Kerry says "nobody could think", and they wake up to things when another plane hits the Pentagon. 8:45 EDT: American Airlines Flight 11 hits WTC. 9:03 EDT: United Airlines Flight 175 hits WTC. 9:03 EDT: President Bush is informed that a second plane has struck the WTC. Senator Kerry witnesses the second plane hit the WTC. 9:10 EDT: President Bush leaves the school in Sarasota, Florida. 9:17 EDT: On Presidential orders, the FAA orders all New York-area airports shut down. 9:40 EDT: On Presidential orders, the FAA halts all flight operations in the United States. 9:43 EDT: American Airlines Flight 77 strikes the Pentagon. 9:45 EDT: The White House orders the evacuation of the White House and Congress. Kerry and his colleagues depart their offices at this time. It should also be noted, that after his capture, Khalid Shaikh Mohammed revealed that a second wave of Al Qaeda suicide attacks by hijacked aircraft were intended, either later that day or that week. President Bush's orders to halt all air traffic in the U.S. unquestionably saved many lives. At 9:10, 7 minutes after the second plane hit the WTC, President Bush is up and moving, and seven minutes after that is ordering air traffic shut down in New York, then at 9:40 across the country, a smart and unexpected move which definitely saved lives. At 9:45, Kerry is still watching TV, not sure what to do. And to this day, he has never mentioned a single specific action he would have taken, were he in the President's place. His claim now, that Kerry would have moved with better and swifter decision than President Bush, is plainly disproven by his own words and actions in the actual event. Doug has reminded me to check my math. President Bush was up and moving at 9:10, and had issued decisive orders by 9:17, so he was moving 7 minutes after the impact, and giving orders no more than 14 minutes after the event, while Senator Kerry continued to stare at the TV.